Display of a proton-proton collision event recorded by ATLAS on 3 June 2015, with the first LHC stable beams at a collision energy of 13 TeV. Tracks reconstructed by the tracking detector are shown as light blue lines, and hits in the layers of the silicon tracking detector are shown as colored filled circles. The four inner layers are part of the silicon pixel detector and the four outer layers are part of the silicon strip detector. The layer closest to the beam, called IBL, is new for Run 2. In the view in the bottom right it is seen that this event has multiple pp collisions. The total number of reconstructed collision vertices is 17 but they are not all resolvable on the scale of this picture.. These measurements, however, are challenging and will take time to complete. Yet the excitement felt in the ATLAS offices is due to another virtue of the higher collision energy in Run-2: the possibility of directly creating new, heavy particles in the most energetic proton–proton collisions owing to the proportionality relation between energy and mass. There are several reasons to conjecture the existence of such particles. Among these is dark matter, a phenomenon believed to involve physics beyond the Standard Model. Dark matter, if it couples to the known particles, could be produced at the LHC and detected by ATLAS in events with an apparent energy imbalance due to energy taken away by invisible (dark matter) particles. These particles could have any mass and couplings, and we neither know whether the LHC can produce them, nor whether the experiments can detect them, even if they existed. 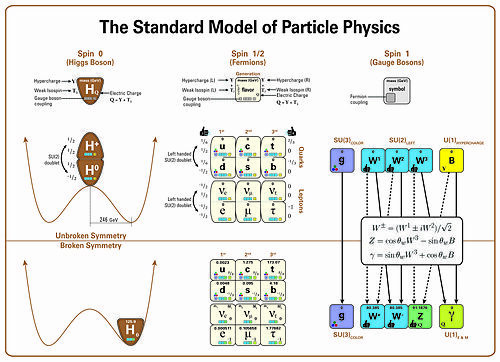 Another motivation for new phenomena beyond the Standard Model lies in an apparent shortcoming of the Higgs mechanism itself. Unlike matter particles, which by virtue of an underlying symmetry appear naturally light with respect to the extremely high energies that are thought to have existed during the earliest moments of the big bang, spin-zero particles such as the Higgs boson in the Standard Model do not have such a protective symmetry. It thus appears unnatural that the Higgs boson is so much lighter than these early energy scales where new phenomena are expected to govern physical laws. A new symmetry, such as the co-called “supersymmetry”, could solve that problem. Other mechanisms exist; all have in common to introduce new particles of which some may be observable at the LHC, and these new particles could potentially play the role of dark matter as well. ATLAS physicists will therefore mine the new data to deeply and comprehensively search for new physics. The higher collision energy will help to rapidly surpass the sensitivity of the searches conducted during Run-1.